The general area of storminess in the Bay of Campeche has migrated over to the southern Gulf of Mexico and into the Yucatan Channel. The National Hurricane Center has designated this area Invest 91L, and has given it a 30% chance of development over the next 48 hours. For those of you joining me for the first time, the following discussion will be a mix of meteorological words that I will explain and old fashioned meteorology. First things first, let me mention that this will be a ragged system for its entire lifetime. Shear over the system is between 20 and 30 knots, which is what gives this system its feathery appearance, and has displaced all of the thunderstorms to the east. Shear is not expected to lessen over the next few days, however as the system begins moving toward the northeast it will gain a more favorable heading. If a system is going in the same direction as the shear, the effect of the shear is lessened, and can even become favorable in some circumstances. Pressures in 91L are lowest just off the northern coast of the Yucatan. The system has gain some organization as the sun has begun to set, and an area of circulation has become apparent. Other swirls have been noted this afternoon. If a main area of circulation can take over tonight, the growth process may begin tomorrow. The main steering mechanisms with this system will be the Bermuda High in the Atlantic which will begin to draw the system northward and a dying front in the southeastern US. That front is actually the remains of the front that caused the Oklahoma City Metro tornadoes last week. The front will act in part like train tracks for 91L, and it will guide 91L toward the north beginning Wednesday night. Below are the spaghetti models, which as you can see are not performing well. The “L” is the current “center” that the NHC has labeled, and you can see that the models did not initialize in some cases anywhere near that L. This plot is from Tropical Atlantic. This storm probably won’t be known for its winds, however I do think that it will be come a tropical depression and possibly a tropical storm. Over the last 24 hours, the better models have shown an uptick in the intensity forecasts to right around a maximum of 40 kts or 45 mph. That being said we probably won’t even be making any sort of forecast like that for another 24 hours. Warm water: Water over much of the gulf is plenty warm to support tropical life, however water temperatures drop off near the Big Bend region. This will stop any intensification that does take place. This will be a very wet week for most of Florida. The main concern for me is the threat of flooding by the end of the week. I believe that just about everyone south of Cedar Key will get 4″ of rain before all is said and done no matter where this thing makes landfall. Some spots could see rainfall totals greater than 10″ of rain this week! That, added to the 4-6″ some places saw last week along the west coast and in south Florida, will total up to flooding in the streets. It cannot be stressed enough: If you see a flooded roadway, TURN AROUND and don’t drown! You don’t know if a roadway has been watched out under a seemingly small puddle or not. One other issue that may come into play on Thursday is the threat of tornadoes and waterspouts. Cloud decks will be very low as this system pushes on by, and the shear this is keeping this system from developing is favorable for tornadic activity. We’ll have to keep our eyes to the sky this week so that we do not get caught off guard. Follow me on twitter @JonathanBelles for the latest on this system with hourly updates. 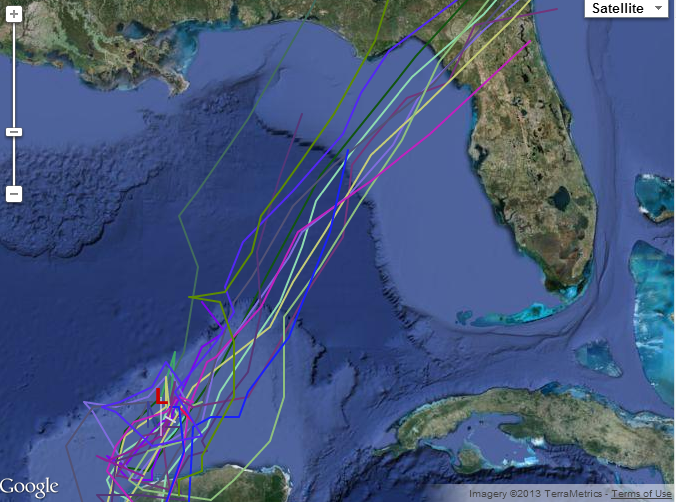 I’ll be watching the AF Hurricane Hunters if they take off as scheduled tomorrow at 2pm ET. Posted on Monday, June 3rd, 2013, in Florida Weather, Tropical Weather. Bookmark the permalink. Leave a comment.